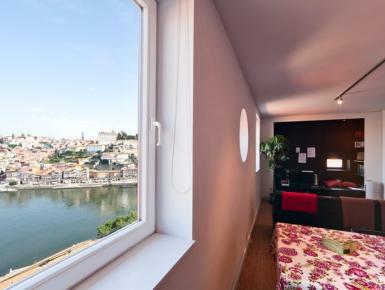 A splendid view of the river Douro and the city of Porto are the background to this extremely pleasant city apartment located in Vila Nova de Gaia. The apartment is composed of bright rooms, laid out in a contemporary and designer style. Its two separate bedrooms are an undeniable advantage for visitors looking for accommodation that is ideal for 4 people. It should be noted that in addition to 4 adults, It should be noted that in addition to 4 adults -WE CAN ALSO ACCOMMODATE TWO EXTRA ADULTS IN A SOFA BED (1,40M X 1,80M) IN THE LIVING ROOM - Ideally located, Very peaceful, Tastefully decorated.